A horrible beast that seems like a tangle of eyes and teeth, the skerpent most resembles an enormous snake—except it has three heads. Of course, they rarely show these heads unless they are about to strike. 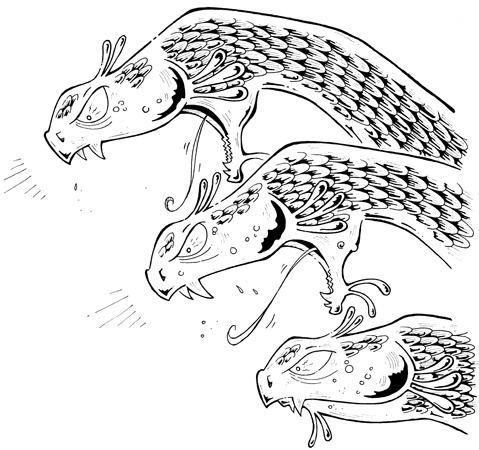 Skerpent have long whip-like tails and thick bodies covered in copper-colored scales. They are nocturnal creatures, preferring to live underground in moist or wet environments. In a group, they are known as a coil. They are also known to eat just about anything, including insects, small mammals, reptiles, and Eens.